Yamaha has launched its new 125cc Saluto commuter motorcycle in India at Rs 52,000 ex-Delhi. The Yamaha Saluto joins the SS125 and the YBR125 in the company's 125cc motorcycle portfolio and is available in a single variant. There are two colour options to choose from- Brave Black and Victory Red. The Yamaha Saluto is powered by a new Blue Core-enabled 125cc air cooled motor which makes 8.3PS and 10.1Nm. The engine base is derived from the new Yamaha FZ version 2.0 and comes mated to a 4-speed transmission. Yamaha says that the combustion chamber is now more compact than before and the Saluto should give a fuel efficiency of 78kmpl. The fuel tank capacity is 7.6 litres. On the looks front, the Yamaha Saluto borrows its lineage from the YBR series. There are drums at both the ends with no option for a front disc brake. The motorcycle has a diamond frame chassis with a length of 2035mm and wheelbase of 1265mm. The ground clearance is 180mm. As far as suspension is concerned, there are telescopic forks in the front and a spring-loaded shock absorbers at the rear. The entire package weighs in at 112kg, making it the lightest in its class. 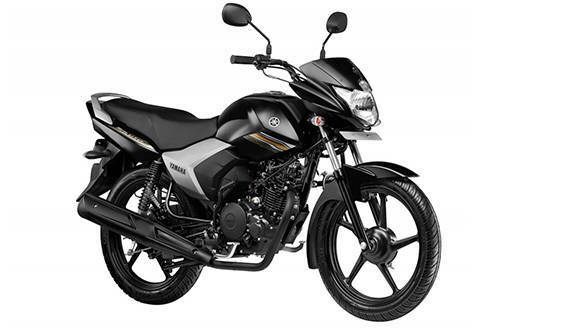 The Yamaha Saluto competes with the Bajaj Discover 125M and Honda CB Shine.